High-availability service management provides the ability to create and manage high-availability cluster services in a Red Hat cluster. The key component for high-availability service management in a Red Hat cluster, rgmanager, implements cold failover for off-the-shelf applications. 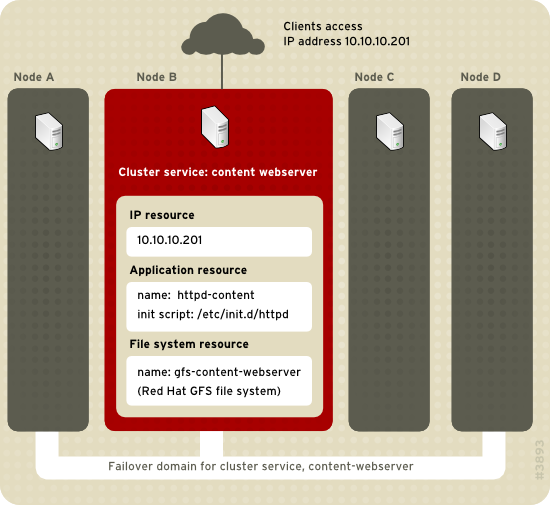 In a Red Hat cluster, an application is configured with other cluster resources to form a high-availability cluster service. A high-availability cluster service can fail over from one cluster node to another with no apparent interruption to cluster clients. Cluster-service failover can occur if a cluster node fails or if a cluster system administrator moves the service from one cluster node to another (for example, for a planned outage of a cluster node). To create a high-availability service, you must configure it in the cluster configuration file. A cluster service comprises cluster resources. Cluster resources are building blocks that you create and manage in the cluster configuration file — for example, an IP address, an application initialization script, or a Red Hat GFS shared partition. You can associate a cluster service with a failover domain. A failover domain is a subset of cluster nodes that are eligible to run a particular cluster service (refer to Figure 1.9, “Failover Domains”). Failover domains are not required for operation. 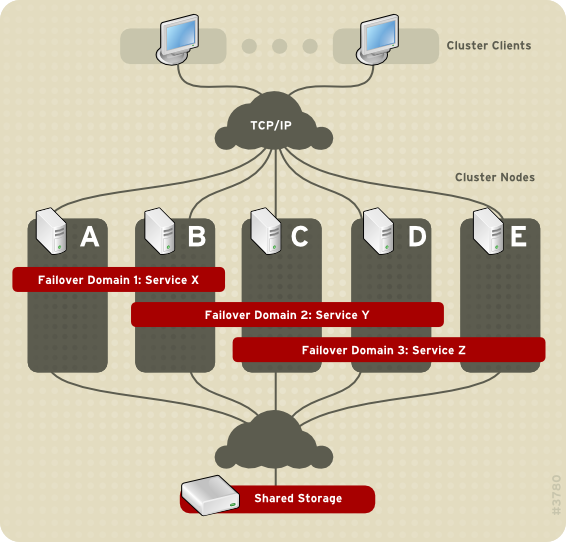 In Figure 1.9, “Failover Domains”, Failover Domain 1 is configured to restrict failover within that domain; therefore, Cluster Service X can only fail over between Node A and Node B. Failover Domain 2 is also configured to restrict failover with its domain; additionally, it is configured for failover priority. Failover Domain 2 priority is configured with Node C as priority 1, Node B as priority 2, and Node D as priority 3. If Node C fails, Cluster Service Y fails over to Node B next. If it cannot fail over to Node B, it tries failing over to Node D. Failover Domain 3 is configured with no priority and no restrictions. If the node that Cluster Service Z is running on fails, Cluster Service Z tries failing over to one of the nodes in Failover Domain 3. However, if none of those nodes is available, Cluster Service Z can fail over to any node in the cluster. IP address resource — IP address 10.10.10.201. An application resource named "httpd-content" — a web server application init script /etc/init.d/httpd (specifying httpd). A file system resource — Red Hat GFS named "gfs-content-webserver". Clients access the cluster service through the IP address 10.10.10.201, enabling interaction with the web server application, httpd-content. The httpd-content application uses the gfs-content-webserver file system. If node B were to fail, the content-webserver cluster service would fail over to node D. If node D were not available or also failed, the service would fail over to node A. Failover would occur with no apparent interruption to the cluster clients. The cluster service would be accessible from another cluster node via the same IP address as it was before failover.